Set a pot of water to boil for the pasta. 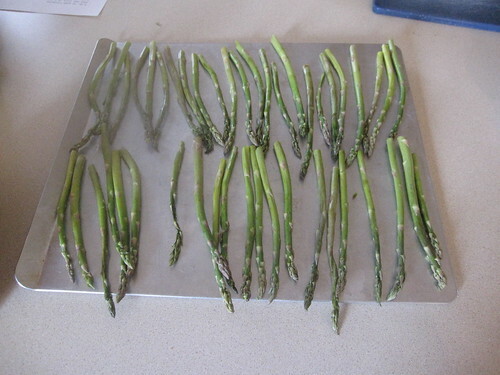 Meanwhile, trim the tough ends of asparagus and place, single-layer, in a lightly oiled roasting pan. Lightly spray or brush olive oil on asparagus as well. Roast at 400 degree, 15 minutes or until it becomes aromatic but not mushy. 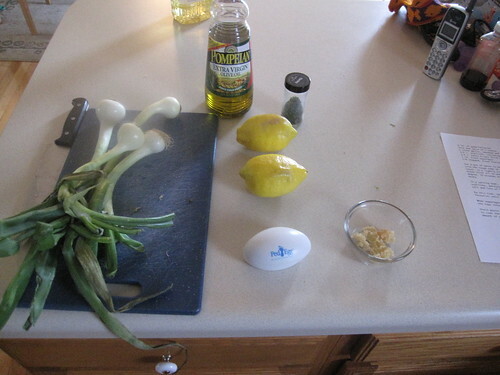 In a serving bowl, place lemon juice and zest, garlic, scallions, parsley and EVOO. Whisk together gently.Add salt and lots of fresh ground black pepper. By this time, the water should be boiling so cook the fettucini until it is al dente. When asparagus is done, cut it all crosswise, leaving the tops intact. Drain pasta and add to ingredients in serving bowl. Toss to coat the pasta. 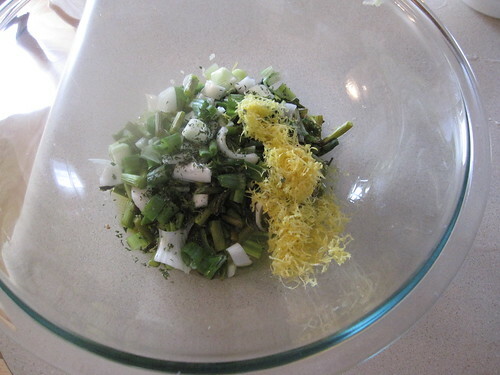 Add asparagus and top with a generous amount of grated parmesan. For the scallions, we just used fresh green onions – a simple and easy to grow substitute. 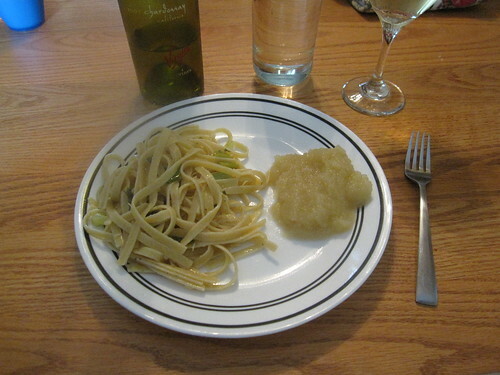 We had the rest of the ingredients on hand except for the fettuccine (and I could have made that with some more time), the lemons, and the asparagus. Our total bill wound up being very close to $7 for the meal. Those of you with a sharp eye will notice an unusual “ingredient” in the ingredient pic – a Ped Egg. Yes, that bastion of infomercials is actually really useful – but not on our feet. We wound up with a PedEgg somewhere along the line – I honestly couldn’t tell you when. It was likely a gift from someone for some reason, because I can’t conceive of a reason why we would buy one. Perfect zest – and very easy! If you’re given a PedEgg at some point and have no idea what to do with it – or see a new one for just a dollar or two someday – pick it up. It’s the easiest zester I’ve ever tried. It was a big hit – everyone liked it. There was enough left over for my wife and I each to enjoy it for lunch the next day, meaning we got six meals out of it for $8 of ingredients – a cost per meal of about $1.33. I would not make any changes to the recipe itself. However, with some thoughtful ordering, you can go from nothing at all to a finished meal on the table in about twenty minutes. Here’s how to do it. First, get a pot of water on to boil before you do anything else. Then pre-heat the oven for the asparagus. While the oven is preheating, cut the asparagus up and put it on the cookie sheet. We used just a bit of canola oil rubbed on the sheet to keep the asparagus from sticking. When the oven’s ready, pop in the asparagus for fifteen minutes. When the water is boiling, toss in the fettuccine, then cut the heat immediately. Let the fettuccine rest in the water for twenty or twenty five minutes, tasting it near the end to see if it’s done yet. 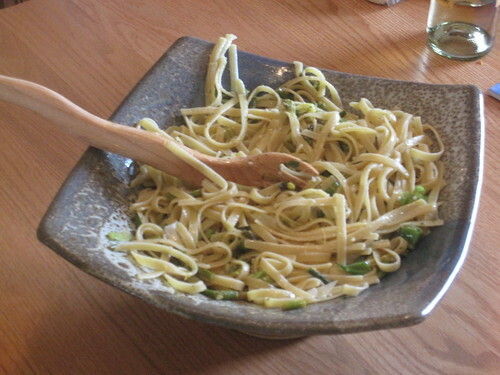 If the asparagus is mostly done by the time the water gets to boiling, you can also just boil the pasta to save some time, but ideally you want to have the asparagus finish 5 to 10 minutes before the pasta so you can cut up the asparagus and add it to the other ingredients. While the asparagus and pasta are cooking, prep the other ingredients. Zest the lemon, peel it, and squeeze out the juice. Chop the scallions. Add the olive oil. Add the garlic. Get those ingredients all ready. When the asparagus finishes, get it out and cut it into little pieces. Add it to the other ingredients and mix. 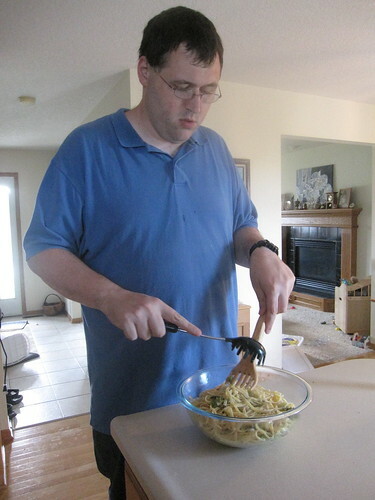 When the pasta finishes, drain it, then add it to the bowl and mix it thoroughly, then serve it immediately.